Since 2015, Cheekwood has been partnering with the Metropolitan Government to present a garden and art installation at Riverfront Park. Cheekwood contributes to the overall care and oversight of the garden, maintaining the perennial plants and regularly installing annual plants that mirror the coinciding displays at Cheekwood. For example, in spring, Riverview Gardens features thousands of tulips reflecting the 150,000 blooming bulbs at Cheekwood. Within Riverview Gardens, Cheekwood exhibits outdoor sculpture from Cheekwood’s temporary exhibitions and permanent collection. The work currently on view is Silent Music II (2013) by internationally acclaimed Spanish artist Jaume Plensa. It is made of stainless steel and stone and is a part of Cheekwood’s permanent collection. In 2015, Cheekwood debuted a major exhibition of large-scale sculptures by Plensa, and Silent Music II was acquired by the Museum for its collection that same year. 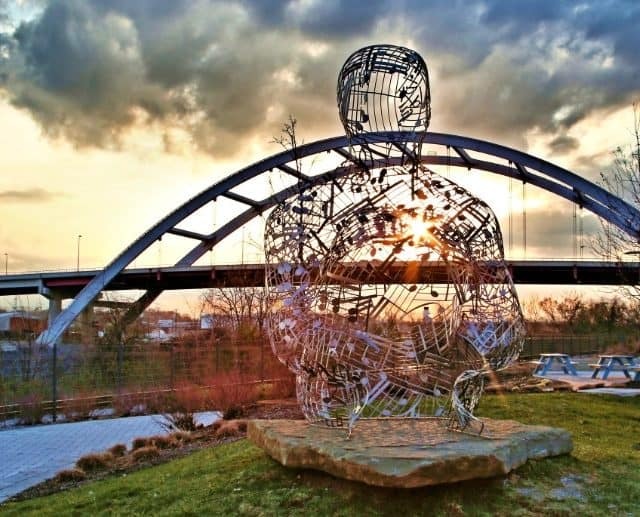 The musical influences behind the sculpture make it particularly relevant for Music City. Uniting the human figure with music notes and symbols, Silent Music II demonstrates the continuing impact music has on the artist, beginning as a child. Plensa grew up in a house full of music and remembers the experience of crawling inside his family’s upright piano as his father played it. He recalls feeling enveloped by the sounds and vibrations and expresses that human experience of music in many of his sculptures. Silent Music II was installed at Riverview Gardens on February 9, 2017. The display of such sculptures in Riverview Gardens demonstrates Cheekwood’s devotion to collecting and exhibiting outdoor sculpture in a beautiful, natural environment.